Call of Duty: Modern Warfare 3 was released on November 8, 2011 for all the current generation home consoles. The Wii version released at a MSRP of $49.99, and it was developed by Infinity Ward/Sledgehammer Games and ported to the Wii by Treyarch, and it was published by Activision. 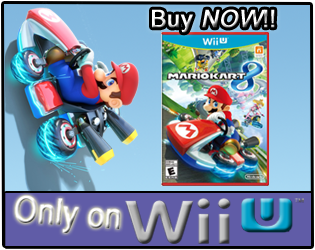 The Wii version received an ESRB rating of "Mature" with "Blood and Gore, Drug Reference, Intense Violence, Strong Language" listed as content for parents and gamers to be aware of. How many hours have Wii owners put into Call of Duty: Modern Warfare 3, and does it appear they are playing the game online any? Let's take a look! 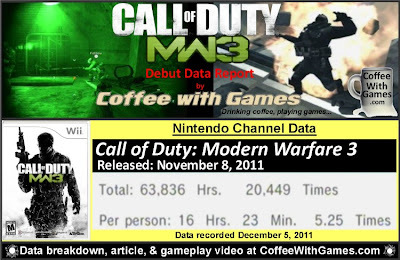 Call of Duty: Modern Warfare 3 has 3,895 Wii owners that have reported data through the Nintendo Channel since it released last month, and the game's average play-time per day/session is 3 Hours 7 Minutes. The Wii version of Modern Warfare 3 has a "professional" review score average of 70.67%, based on 9 reviews on GameRankings.com. The game currently has a 4 out of 5 Stars rating on Amazon.com, based on 21 customer reviews. When converted to a 100% review scale, Modern Warfare 3 has an 84.76% review score average from the 21 reviews on Amazon.com. I have been enjoying my time with Call of Duty: Modern Warfare 3 on the Wii, and if you aren't aware, the Wii version has been patched not once, but twice now; and they even did some behind the scene "fixes" that didn't require a download. I finished the single-player campaign in roughly 6 hours, and have spent about another 2 hours going back and playing through some of the levels again. 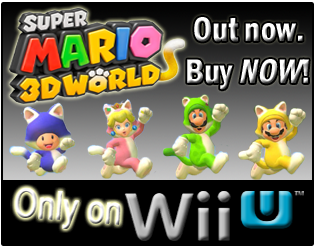 Based on the reported hours, I definitely think Wii owners are playing the game's online multiplayer. Seeing Call of Duty: Modern Warfare 3 debut already I think continues to show there is a market for FPS games on the Wii, and specifically FPS games with online multiplayer even given the Wii's online use of "friend codes". Have any of you been playing Call of Duty: Modern Warfare 3? If so, which version have you been playing? I actually haven't played Modern Warfare 3. I've played through World at War and most of Modern Warfare 1 (both on PC), but the games are all so similar that I can't see investing $50-$60 in the same ol' same ol'. My last CoD game was Reflex on Wii. I enjoyed the single player save for the gratuitous use of grenades in the campaign. The aiming was awesome, and the action was generally intense. I never got into the competitive multiplayer aspect as I thought players died too easily. While the gameplay is definitely similar in all the Call of Duty games, at least the ones I have played, the stories are different. Now, I know probably the majority of Call of Duty fans buy the games for the multiplayer, so the story probably doesn't matter to most; though I have played/enjoyed the single-player campaigns in World at War, Black Ops (better at the end), and Modern Warfare 3 now. "...save for the gratuitous use of grenades in the campaign." Glad to know World at War is not the only Call of Duty game to have this "feature". I played through Call of Duty: World at War twice. Once on "normal" difficulty, the second time on "Veteran". I could not believe the insane amount of grenades thrown by the enemies, and not just how many were thrown, but the incredible accuracy of them as well! As for, "I never got into the competitive multiplayer aspect as I thought players died too easily." I'm guessing you prefer the multiplayer more in games like The Conduit, where it takes a lot more ammo/rounds to take an enemy out? Sadly - I have not yet gotten to play this. However, I know I will be - and likely on the PS3. My son wants this game quite a bit, and has already said that if he doesn't get it for Christmas (he won't), then he'll use his money and gift cards to get it right after. plying game is one of my hobby. You share such nice information about modern warfare 3. Due to your post I get lots of knowledge about this game.